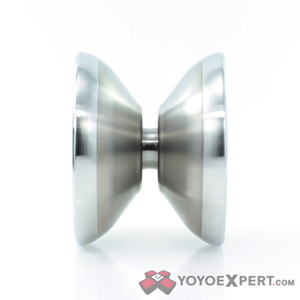 YoYoExpert Blog & Yo-Yo News – New Titanium Bi-Metal! The Magicyoyo REX! New Titanium Bi-Metal! The Magicyoyo REX! MagicYoYo is widely known for their affordable entry-level yo-yos, but with recent projects they have begun moving into more high-end specialty releases. They have a few bi-metals and now they’re getting into the serious stuff with their latest release; The Titanium/Stainless Steel bi-metal REX! The REX was designed in collaboration with professional yo-yo player and designer Yixing Tan. They wanted to create an advanced full-size model for competition and that’s exactly what the REX feels like. 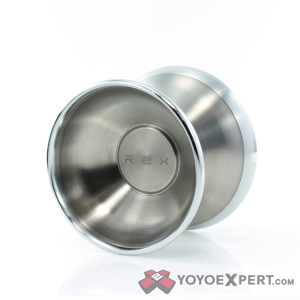 Utilizing the ideal materials for a bimetal design, the REX is composed of a titanium body and stainless steel rims to ensure a unique weight distribution that is unlike any other yo-yo. It spins with incredible power and stability, yet plays even lighter than expected! The body is machined with super thin walls ranging from 0.5 to 0.7 mm thick. The thin walls keep center weight down and the stainless steel weight rings, which account for over 50% of the total weight, add plenty of rim weight to maximize stability and spin power. The beautiful curved profile makes the REX comfortable in the hand and very pleasing to the eye. Finished with a simplistic modern engraving the REX has a really premium style that looks just as good as it plays!